Still remember how we came up with the whole Sharehouse idea a few month ago when we were in a friends house in Cape Town – with a kicker table (fussball they call it here) and the World Cup with Vuuuuvuuuuzelas around us. Or was it at Coffee Bay where cows graze on slopes so steep I hardly could walk them, or when we were snowed in close to Indwe on a sheep farm and where we were longing for a city lifestyle after years on the sweet sweet countryside? Now, three month later, we still feel very small with a big idea: to run a warehouse with coworkers, teaching, community building, arts and design and a restaurant. If I could I would have just bought or rented a space in Woodstock, Cape Town, and Elke and me would have started. Or Berlin squatter style, occupy the space. There we would have been typing away in echoing lofts stripped bare to nothing, manufacturing our very on Ikea furnitures, designing and cooking the two simple dishes we want to serve every day and teaching the few that we let in. That would have been very Ego and 90s, even 80s? Lucky we didn’t. 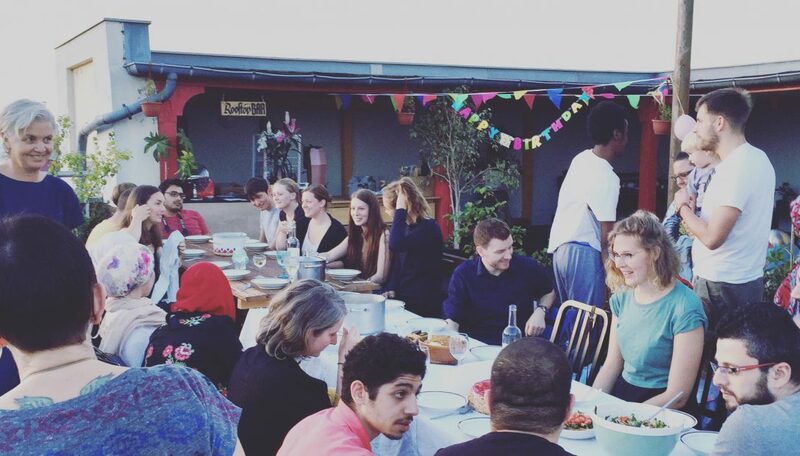 God keeps us humble because after all it’s a Sharehouse where a new way of community is lived out and evrything is …. shared. Sorry, love, not you, but many things like ideas, resources, space. Lucky we didn’t just move into the old meat/cotton/woodwork factory because it is about people. All the free Wifi, city view, hot coffee, fine art, groundbreaking design, revolutionary furniture, radical eatery and blaring beautiful clothing range are worth nothing without you, you and you. All these years as writers we got to the habit of doing things ourselves. It is a blessed profession, because our books get printed as we wrote them and remain our work. It is a very solitary work and the absolute contrary to what we want to do at the Sharehouse. Maybe that is why we wanted to do the Sharehouse. We learned to share in our dorpie, the village we live in. The dynamics of who helps, stirs, encourages and sues who are stunning. Very close, very funny, a novel itself, and the only reason for us to pop up the Sharehouse in Capetown is our hunger for the arts and the urban life. We are not alone, our teenage kids are also growling for more, their eyes light up in the Stanford thicket, hungry – or is it their cellphones? Yet we are still here in the dorpie, praying, building, sowing, writing, dreaming, thinking even bigger, but just being able to pay the rent and overcoming our pride. And that’s good. We even applied for the local market to sell salads and chilli con carne. I would have cringed half a year ago doing that. The slow transformation of a “schreibtschtäter” who likes to think up things like novels and Sharehouses at his desk towards a doer who works with his vision. Yebo. If we want to start a Sharehouse restaurant we have to speak to all those who we want to feed. And we have to get orders for our furniture to build more and to get some manufacturers involved and so on. Sowing, watering, fertilizing. But, hey! If you happen to have a warehouse and some cash, don’t hesitate to call us. Very interesting. Love the skate park idea, my fiance has been trying to teach me how to skate, so I believe it will be a fruitful engagement this skatepark. Looking forward to it.